This is Robotech at full force! 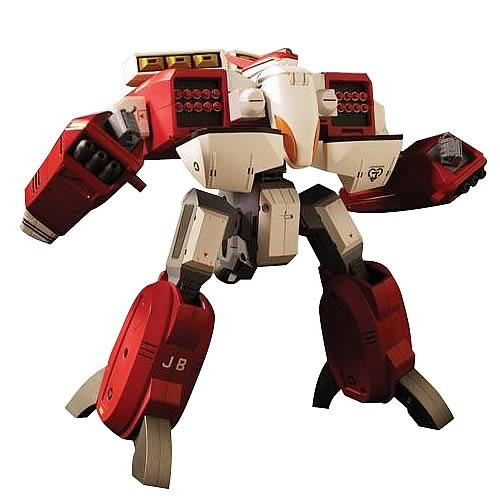 This Robotech Masterpiece Collection Beta Fighter Volume 2 is an astonishing item that will be vigorously sought after by mecha collectors and admirers of Robotech alike. So, act now! In sturdy die-cast metal and plastic, at 1:55 scale, the terrifically detailed figure features a functioning cockpit, pilot figure, metal landing gears, and a display base. And, he transforms! Based on new character art by Tommy Yune, he's an individually numbered, limited edition of 10,000 pieces that comes with a certificate of authenticity. Mecha-nize your collection by adding Beta Fighter Red to the mix! Stands about 9 1/2-inches tall. This fully transformable collectible attaches to the previously released Masterpiece Alpha Fighter (sold separately) to create an impressively large fighter craft! Fully poseable, the Beta Fighter is transformable into 3 configurations: Fighter Mode, Battloid Mode, and VTOL Mode. The Beta Fighter arrives in its trademark "book style" packaging. After years of demand from fans, Toynami is proud to announce the introduction of the latest release in the Robotech Masterpiece Collection: The Beta Fighter! Designed to link up with the Masterpiece Alpha Fighter, the Masterpiece Beta Fighter - Volume 1 offers a blue decoration scheme. Volumes 2 and 3 are in red and green, respectively. Ages 18 and up.